We have a winner! Thanks to everyone who entered the first giveaway here at Buck$ome Boomer’s Journey to Retirement. I hope you keep reading. 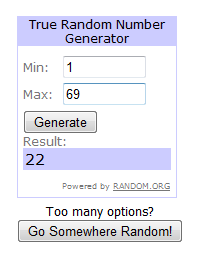 Before revealing the winner, let me tell you when counting out comment 22, I skipped my comments to arrive at the winner. The winner is……. Pat’s been contacted via email and if the gift card is not claimed within 48 hours another winner will be selected.